I’m wondering, has anyone out there tried this toy? It’s called the Triple Threat Acrylic Cane and I found it among the spanking toys at Lovers Package. It looks evil and I’m sure it is…but I can’t help being curious. I’d like another toy like the cane but I’m wondering if an acrylic one would be more intense. Also, I don’t think they call it the Triple Threat without a reason. acrylic is a tough tough material, and denser than rattan, so it follows suit that they’re heavier, too. the marks the cane left on me (the acrylic one) were heavy, deep bruising. welts faded in a few hours, but the deep bruising stayed for a fortnight. very cute toy……i don’t think i would let the pink fool you though…that thing is going to burn! We actually have that model. The good/bad (depending on how you look at it) part of it is, it has a rubber ring that can be moved up and down the length to make it firmer. So you either get the “sting” of 3 very thin canes or one heavy one depending on where that ring is placed. 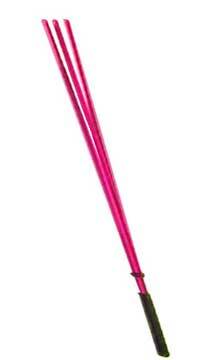 My Husband likes it because it makes a much louder “swoshing” noise than a regular cane does. They are very VERY stingy. Leave marks too.